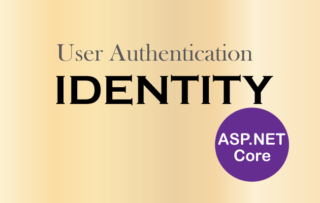 With my ASP.NET Core Identity system set up I am now ready to use it. Here I will do the CRUD Operations for Creating, Reading, Updating and Deleting Users from the Identity system. In the last tutorial I explained the Setup and Configuration of Identity Membership System, if you missed it then first look into it. To create Users in Identity Membership System I will need to create a Model Class. So create a class called ‘User.cs’ inside the Models folders. Next, create ‘Controllers’ folder in the root of your project, and there create a new Controller called ‘Admin’ inside the Controllers folder. Inside the Admin Controller I will perform all the CRUD Operations. The first thing to do in the Controller is to get the instance of UserManager through Dependency Injection. This class is use to for managing users, here I will use it to create a new User. The Create Action method (POST Version) is the one which creates the new user. It takes an argument of the User class and checks if the Model State is valid or not. After this, I create the user from the UserManager class CreateAsync method. As you remember I get this class object through Dependency Injection. Succeeded – this property returns true if the create user operation completes successfully. Errors – this property returns an object of type IEnumerable that contains the errors occurred when performing the create user operation. The IdentityError has a Description property which gives the description of each of the error that happened. I use the Succeeded property of the IdentityResult class to find out if the create user operation completed successfully or not. If the Model State is invalid then I am returning to the Create View where the errors will be shown to the user so that he can correct them and try once again. The View has a simple form which is used to create a new user in the Identity system. The form contains 3 input controls for – Name, Email and Password, these values MVC binds to the properties of the Model class that is passed to the create action method. 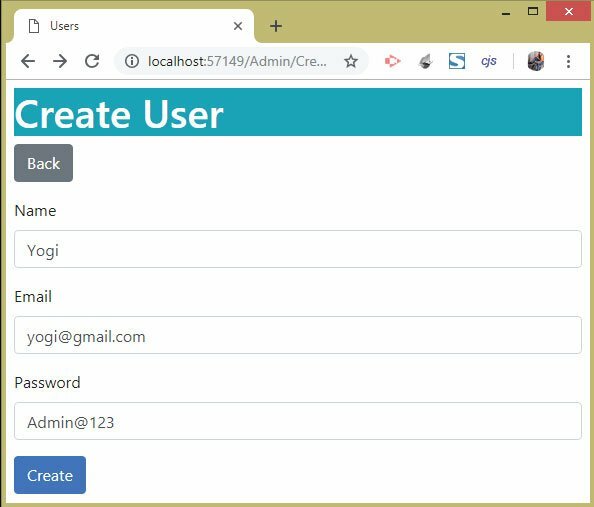 You can now create a new user by running your project and go to the URL – ‘/Admin/Create’. 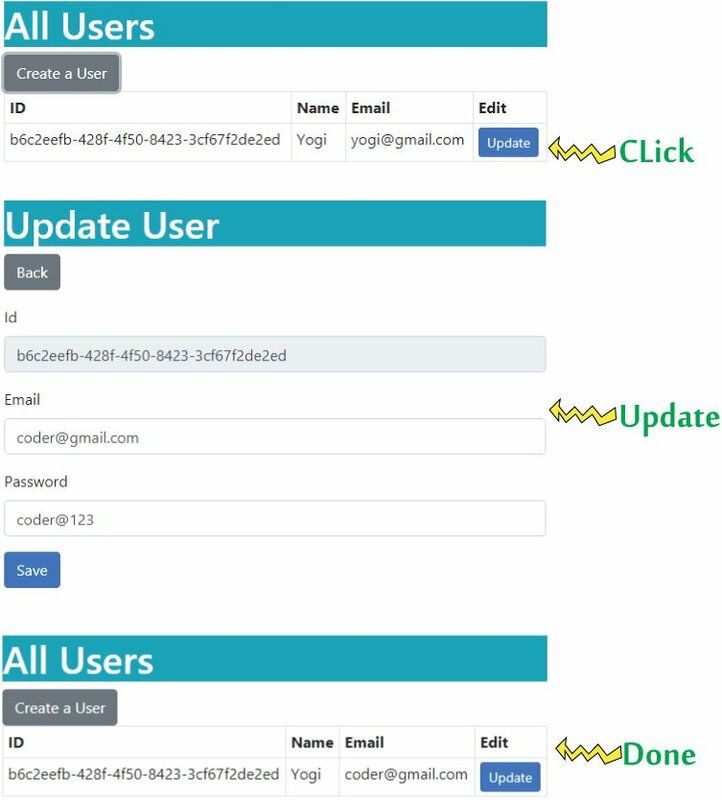 Fill Name, Email and Password (as shown in the below image), and click the ‘Create’ button. Once the User is created you will be redirected to the Index View. The Index View will show the entire User account stored in the Identity database. I will create this feature next. You cannot create a same user again. 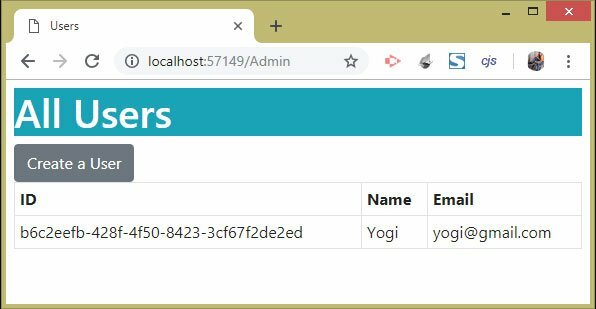 If you again go to the Create URUL and fill details of a User who is already created then you will see an error message saying – ‘User name ‘Yogi’ is already taken. All the User accounts of Identity System can be fetched by the ‘Users’ property of the UserManager class. The Users property will return an IEnumerable object. The View receives a Model of type IEnumerable. I am looping over all the users using for each loop and showing them inside a table. You can now check the Reading all Users functionality by going to the URL – ‘/Admin’, which will invoke the Index Action method. Now I will do the updating of the Identity System Users. For this add a new column called ‘Update’ in the table given in the Index View. In this column I will create an anchor tag that will link to the ‘Update’ Action method. So add a new ‘th’ element to the table and also add a new ‘td’ element inside the ‘tr’ element. The ‘td’ element will contains the anchor tag. Before creating the Update Action method to the Admin controller, I will need to add a dependency of IPasswordHasher in the constructor. It is used to get the hashed value of the password of the new password provided by the user. Note that in Identity System passwords are stored in Hashed value instead of plain text. This gives added security. The GET Version of the Update Action takes a string user’s id value. It then fetches the User’s information from the Identity Database using the FindByIdAsync method of the UserManger class. The FindByIdAsync method is provided with the Id of the User in string format. Once the User’s information is fetched, it is then send to the Update View as model. The Post version of the Update Action is where the updation of the User’s information is done. This action is invoked when the user click the submit button on the form given in the Update View. Then, if the AppUser object is not null, I proceed by checking if the new email and password values given by the user are not empty. If they contain some value then I update the Email and PasswordHash property values of the AppUser object to the new ones provided by the user. You can now test the update feature by going to the ‘/Admin’ URL. There click the Update button which will take you to the Update page. Add new Email and password and click the save button. This will update the User record stored in the Identity database. The Action method receives the User Id and it fetches the user details using the FindByIdAsync method. I get the User details in an AppUser object. If the delete operation completes successfully then I redirect to the Index Action method else the ‘Errors’ method is called to show the errors to the user. The delete button needs to be added to the table of the Index View. Add a new ‘th’ element called ‘Delete’ to the table, and also add a new ‘td’ element that will contains a form (with action ‘Delete’ & route-id as the user id) and a button. Run your application and go to the URL- ‘/Admin’. 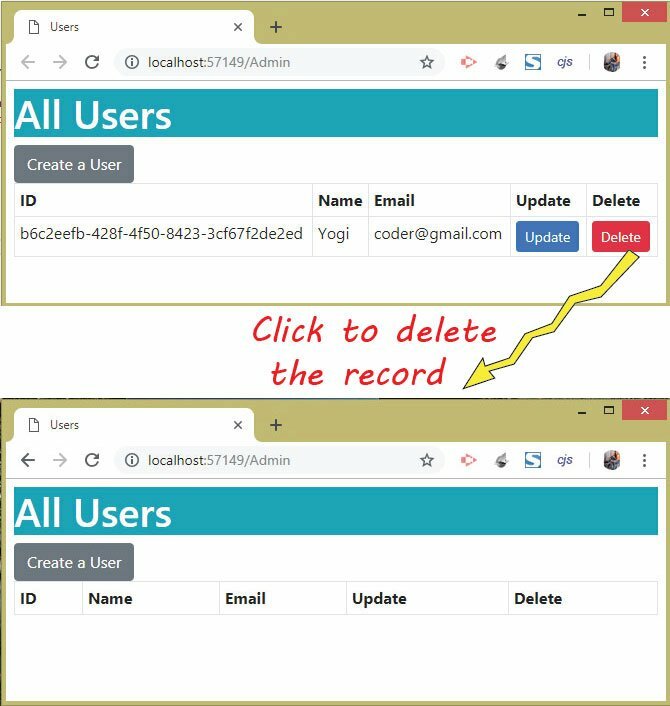 Here you will see the User records have a delete button. When you click the delete button then the corresponding user record will be deleted from the Identity database. This completes the procedure to manage user in Identity system. You can now add, update, read and delete users from Identity database. In the next tutorial on Identity I created Username, Email & Password Policy which will help you to create your own custom rules in Identity.